Semesteropgave i engelsk om pragmatic competence. 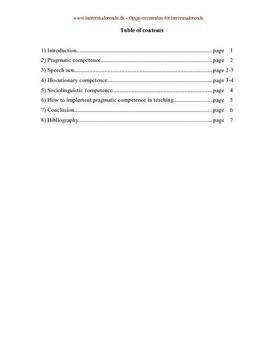 How to implement pragmatic competence in teaching, and is it important to learn? I have chosen to write about pragmatic competence, because I think it is a subject English teachers need to deal with in teaching. It is impossible to fulfil the demands of the CKF for the Folkeskole without implementing pragmatic competence. According to the CKF, central knowledge and skills areas, teaching in English shall comprise both a linguistic and a cultural side. The teaching shall enable the pupils to use English as an international means of communication, and because of the increasing globalisation pupils need to learn how to understand different types of spoken English, and on reacting to it in a way which is suitable for the situation. In order for teachers to meet the demands of the CKF, they need to arrange learning opportunities in such a way that they benefit the development of pragmatic competence. Otherwise the demands of the CKF won't be met, and pupils will experience communicative misunderstandings and they might fail to get good grades. Lack of pragmatic competence makes it difficult for pupils to understand native speakers, and they might also offend people unintendingly. Materialer relateret til Semesteropgave om Pragmatic Competence.